some Texas travels, so I must make this short and sweet. it all depends on where in philadelphia you're staying! if you're in center city, there's a ton of good restaurants and bars to check out - i like jones, vargas bar, and el vez. there's also all the shops in rittenhouse that are worth visiting. old city has more little boutiques and upscale restaurants - very expensive, but gorgeously styled. if you have any questions, feel free to send me an email! Have a safe trip to Philadelphia! I love your outfit! I like how you paired the cardigan over you skirt and shirt. And your shoes are so cute! I really like your bag too. as beautiful as always! love that cardi! and good luck with the interview! 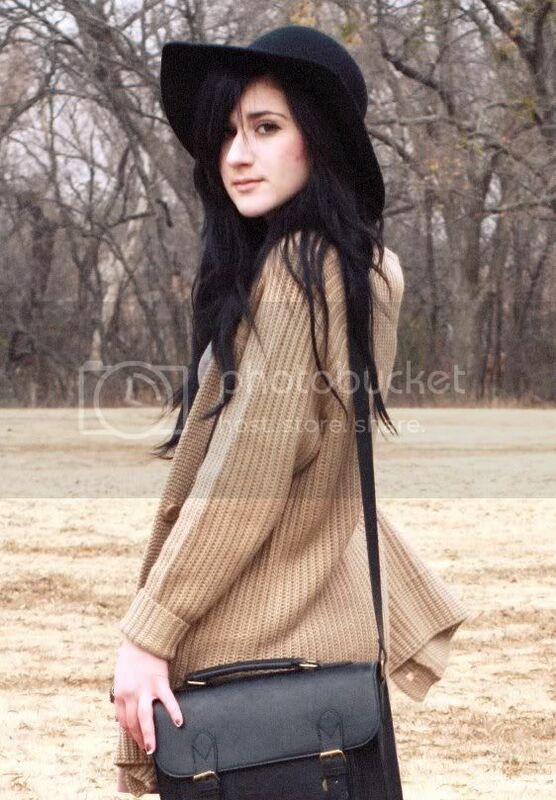 I love this outfit especially the oversized sweater with the booties. Aw, you're going to have a blast in Philly; I love this city! We have an amazing UO and H&M as well as some pretty awesome restaurants. Just prepare for our extremely cold weather..
Wishing you good luck for your interview! Cute pics! Love your tights and your bag! I really want a cosy cardigan like that, perfect for snuggling up in! Oooh sounds like you are having a good holiday though, doing lots of fun stuff!! Sadly I've only been to Phillie a few times, don't really know what's around there. I live in northern liberties in Philly. Some of my favorite shops are Arcadia Boutique, Topstitch, Smak Parlour, and there are also a lot of good thrift stores. If you are there on the first friday of the month, there are cute crafts and art being sold in Fishtown and Old City. You look lovely Bonnie, I adore those tights! Wish we could have met up while you were in the city, but glad to hear you enjoyed it. I hope your holidays were good as well. I wish you luck on your interview. You look great and I love the softness of the colors. The skirt is my favorite part of the look. You look amazing! The cardigan looks so comfi, and I love your shoes and bag! Lovely outfit - and I hope you have a great trip to Philadelphia, that's one of the few places in my area that I haven't made it to yet but dearly hope I can before I move away from here. Despite having lived in PA my entire life I've never been to Philly, so I won't be any help to you haha. But I hope you've been having a fantastic holiday too! :) I love your tights and of course your sweater. Hi! sweetie! Pink and gray are my favorite! beautiful outfit! Oh the colours here are just perfect. love the color combination here! I love this outfit! The color scheme ... and like everyone else said, the tights! Love how these photos turned out! Good luck with your interview, I'm beyond excited for you! I love your skirt and cardigan! interviewing in Philadelphia sounds like a lovely trip :) URBN is based there! The colors on this outfit are really cute! You look so amazing! What beautiful soft colors! Good luck on your interview! i love this outfit. those tights are cute! All the textures together look so awesome! Great job! Great outfit, I love the tights! Good luck with your interview! hope you had an awesome christmas darl! and i realize that you have so many amazing shoes..
i'm so sorry. but i am addicted to your blog. How darling is this outfit! I love the colour of that skirt, it's super delicate. your style is... amazing! I can't say anything else. Lovely as usual! love your satchel and your books. I send you a big kiss! I love the pastel colours of your outfit, so beautiful. Glad you enjoyed your Christmas, have a happy New Year. U look so adorable as always, darling! Like your outfit so much!Really love the hat!Nice holidays! Love your shoes and your bag !! loving this look! and I want those tights! where are they from? Checking your lookbook has become part of my daily routine! 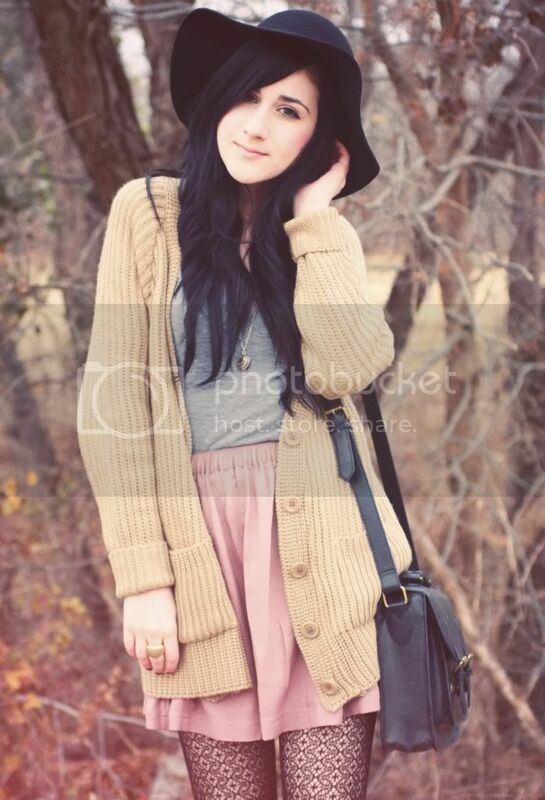 your tights are so beautiful and I love your hat! I haven't had the chance to really enjoy the holidays because I have to study for my exams, eck! beuatiful hat! and those tights are fab! Oh, so lovely outift! Love the powder pink tone. I hope you had a great holiday. I don't mind that it's over. I was so tired of cooking and visiting relatives. I love your bag. It's very chic and goes perfectly with the light colour scheme you're working in this picture. love the cardi and hat! i got a big gray floppy hat and can't wait to wear it! enjoy your travels! Wow i adore this whole outfit! following also i love your blog. Soft, feminine, and so natural. Love the outfits here! The cardigan looks so cozy; I'd love! ohhh and following you now !! what a lovely outfit! I love the colours you've chosen. so great. Gorgeous outfit!! 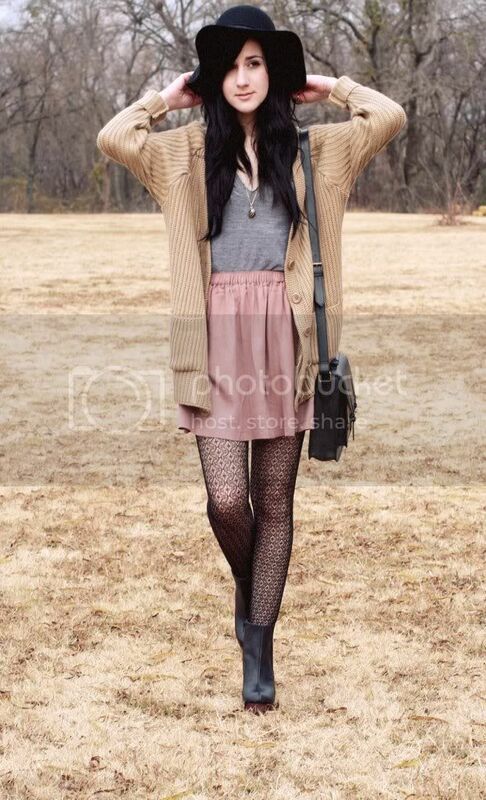 I love the pastels and the tights are just adorable! :) You look beautiful! hope u are having fun travelling !! and the hat looks so nice on you too.. I always get excited to see that people actually visit my city... even though I never have any suggestions! I second what Veronika and a few others said - if you're looking for boutiques, Old City is the place to go. There's also a Buffalo Exchange uptown, along with some other chain stores. I have to admit, I don't know much about the restaurant/bar scene, especially since I'm underage and vegan. Good luck with your interview! Great outfit pics, I love the shoes! Lovely outfit! Your tights are awesome. Good luck on your interview!!! These outfit is beautiful as always. Especially the first picture is too cute to not save as inspiration. I always enjoy your looks so much! In my latest post I used another pretty picture of you as inspiration, hope you don't mind! Of course I placed a link with it. i’ve been following your blog for a while and i love love love your style. just to let you know, i’ve featured one of your outfit shots in my summary of A/W 2010 trends here: http://www.elleandthefashionfolk.blogspot.com . i’ve linked back to your blog underneath the image, but if you want me to remove it, just let me know. Ahh you're coming to philly? That's so exciting--if you get a chance, drop by university city :)It'd be super awesome to meet you! Love your outfit! That skirt is such a pretty color. I love your outfit. Everything is just perfect ! Lovely outfit :) The cardigan looks so warm and cosy. hi, i really like your style. Very nice blog keep it up!